MOSCOW, February 28. /TASS/. Russia and Austria have reaffirmed that there is no alternative to the Minsk peace agreements, seeking to solve the Ukraine crisis, Russian President Vladimir Putin said on Wednesday after talks with Austrian Federal Chancellor Sebastian Kurz. "We have discussed the situation in Ukraine," Putin said. "We share an opinion that the Minsk agreements remain the basis without any alternatives for the crisis to be resolved." Putin reminded that Kurz, while being Austria’s foreign minister, focused his attention on the intra-Ukrainian conflict and was involved in the issue during Austria’s rotating OSCE Chairmanship in 2017. In the second half of the year, Austria will assume presidency at the European Union. Putin and Kurz discussed prospects for relations between Russia and the EU and emphasized the importance of maintaining full-fledged ties between them both in politics and the economy. "In the context of the current state of affairs in the Middle East, and primarily in Syria, we have underlined that the primary significance is that the world needs to join efforts against terrorism, leaning on the coordinating role of the United Nations and the norms of international law." 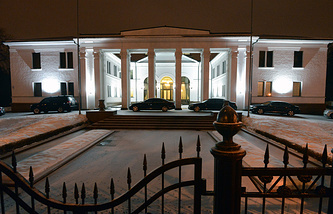 Peace settlement of the conflict in Donbass rests on the Package of Measures, known as Minsk-2, that was signed by the Trilateral Contact Group on Ukraine comprising senior representatives from Russia, Ukraine and the European security watchdog OSCE on February 12, 2015, after marathon 16-hour talks between the leaders of the Normandy Four nations, namely Russia, Germany, France and Ukraine. The 13-point document envisages a ceasefire between Ukrainian government forces and people’s militias in the self-proclaimed republics in Donetsk and Lugansk starting and subsequent withdrawal of heavy weapons from the line of engagement. The deal also lays out a roadmap for a lasting settlement in Ukraine, including local elections and a constitutional reform to give more autonomy to the war-torn eastern regions.